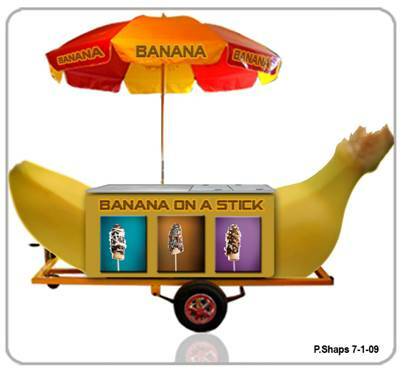 Nikki has decided to start her own business of selling frozen bananas on a stick at the beach from a portable cart. Nikki's explicit costs include the cart, the bananas, stick, melted chocolate, napkins, candy and nuts, etc. All of her explicit costs combined total $30,000 annually. Before starting her business, Nikki was a secretary, earning $25,000 a year. Because of this great opportunity of starting her own business, Nikki gave up her job and also the $25,000 a year salary. The $25,000 a year salary Nikki would have made would be considered her implicit costs. The implicit costs are similar to opportunity costs since something is being given up at the cost of something else. Nikki, in this case, is giving up her yearly salary and also all the time necessary to own and operate her own, banana on a stick business. Although it was extremely hard work, Nikki was very successful and had annual revenue of $65,000. 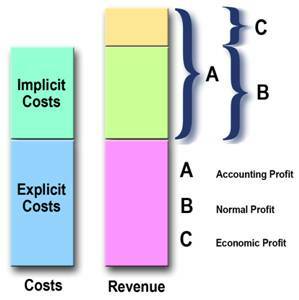 The Accounting profit is the difference between the revenue and explicit cost. The Economic profit is the difference between the revenue and the Explicit costs. Normal profit is a cost and in this case it is the cost of Nikki's time to run the banana cart. Economic profit is the profit after both implicit costs and explicit costs have been deducted from the revenue. Nikki’s economic profit (C) is $10,000.